Our team of dental specialists and staff strive to improve the overall health of our patients by focusing on preventing, diagnosing and treating conditions associated with your teeth and gums. Please use our dental library to learn more about dental problems and treatments available. If you have questions or need to schedule an appointment, please call our office. Although oral cancer may not get as much attention as some more widely-known types of cancer, that doesn't mean it's any less deadly. In fact, it is estimated that in the United States, oral cancer is responsible for killing one person every hour, every day. While it accounts for a relatively small percentage of all cancers, oral cancer is dangerous because it isn't usually detected until it has reached an advanced stage. At that point, the odds aren't great: only about 6 in 10 people will survive after five years of treatment. If there was a simple test that could give you an early warning about whether you're likely to have this disease, would you take it? The good news is — there is! Since early detection has been shown to increase the survival rate of oral cancer to 80% or better, this test can truly save lives. And best of all, having an oral cancer screening is part of something you should be doing anyway: getting regular dental checkups. 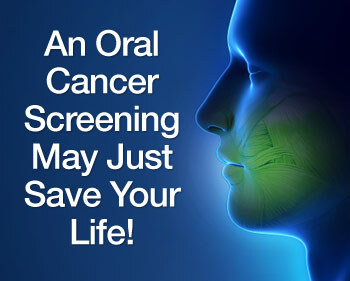 An oral cancer examination is fast and painless. Its objective is to identify small changes in the lining tissues of the mouth, lips and tongue that may signify the early stages of this type of cancer. The screening is primarily a visual and tactile (touch) examination. If any abnormalities are noted, a small tissue sample can be retrieved for further testing in a laboratory. Who's At Risk for Developing Oral Cancer? The answer might surprise you. Oral cancer used to be thought of as an older person's disease, and it still mostly affects those over 40. But today, younger people form the fastest-growing segment among oral cancer patients. This is primarily due to the spread of the sexually-transmitted Human Papilloma Virus (HPV16). Of course, the other major risk factors still apply: If you're middle aged or older, a moderate to heavy drinker or a long-time tobacco user, you have a greater chance of developing oral cancer. Chronic exposure to the sun, long known to cause skin cancer, is also associated with cancers of the lips. Genetic factors are thought to have a major impact on who gets the disease as well. A thorough screening for oral cancer is part of your routine dental checkup — another reason why you should be examined regularly. The screening includes a visual assessment of your lips, tongue, and the inside of your mouth, including a check for red or white patches or unusual sores. You may be palpated (pressed with fingers) to detect the presence of lumps and swellings, and your tongue may be gently pulled aside for an even better view. A special light, dye, or other procedure may also be used to help check any suspect areas. If anything appears to be out of the ordinary, a biopsy can be easily performed. If you notice abnormal sores or color changes in the tissue of your mouth, lips and tongue, they may be a symptom of oral cancer — most, however, are completely benign. But sores or other unusual changes that haven't gone away by themselves after 2-3 weeks should be examined. Remember, the only way to accurately diagnose oral cancer is through a laboratory report. Early diagnosis, aided by thorough screenings at your regular dental checkups, is one of the best defenses against oral cancer.